Blurb: While technically, there is absolutely nothing to complain about, it is ultimately just another Project Pitchfork album. 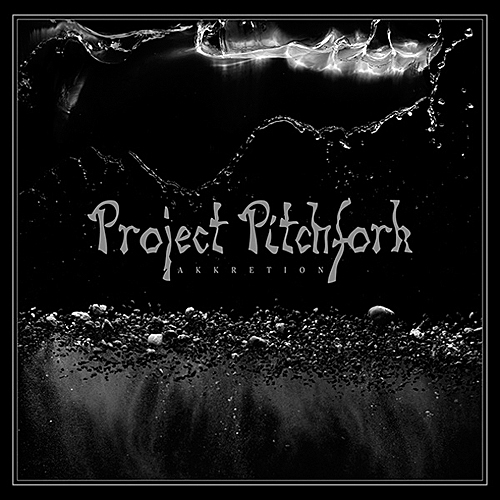 There is not much one can say about Project Pitchfork without sounding redundant. Consisting of Peter Spilles, Dirk Scheuber, and Jürgen Jansen, the German outfit has for almost 30 years been producing top quality dark electro that others aspire to emulate, and it seems with Akkretion, the band also wishes to emulate itself. The opening title track works incredibly well as an introduction, building and receding until ending with a pervading eeriness. “Good Night Death” with its beautifully high-pitched synths supporting Peter Spilles’ vocals, standing as the first true highlight of the album. The manner in which the layered synths, underscored by subtle strings and percussion, expand during the chorus carry this song. While the previous two tracks began sedately, “Gravity Waves” begins with a bit more of an up-tempo feel. The bass line has more energy, the melody is a bit lighter, the percussion more clicky, and the accents more jumpy. During the chorus, there is an almost imperceptible harmony voice that expands the sound substantially and beautifully. “This Collision” continues the up tempo feel with a vigorous bass line, but controls the mood with a vocal sample promising the ultimate demise of our planet. While the vocals on previous songs were not hidden or lacking in meaning, the lyrics here seem to hit a bit more solidly. From here, the album’s strange rhythmic balance is set. For instance, “Circulation” introduces itself as the first true danceable track on the album, the aggressive vocals supported with an incessant synth melody and equally unremitting bass line. The track builds and ramps up the intensity until breaking down and leaving with an unnerving synth tone. 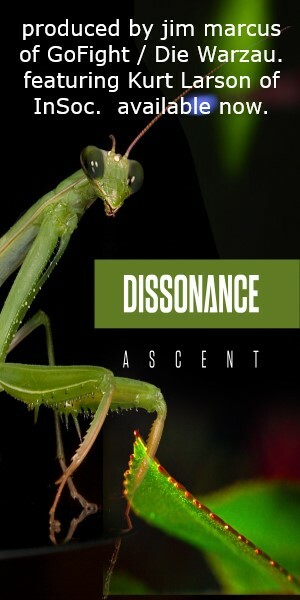 “Ascension” continues the danceable atmosphere and feels like a more traditional, old school EBM track. While there is absolutely nothing to complain about with Spilles’ vocal performance, once you hear the remix version on the deluxe edition with Sue providing additional vocals, you understand why her version was used for the music video. Musically, this is easily one of the strongest tracks on the album with one of the cleanest piano melodies I’ve heard. On the slower side, “Crossfire” begins with gentle waves supporting a slow cymbal crash, which then returns to introduce new aspects to the soundscape announcing the start of the bass line. Joined by timpani, big bass drums, and a nice snare that really carries the pace of the track, this song really shows off Project Pitchfork’s ability to use accenting percussion beautifully. The cadence of Spilles’ vocals braces this gentleness, even if some of the lyrics are anything but gentle. And while certainly not sedate, “The New Day” seems to take the tempo down a level or two while keeping the EBM feel. The melody is decidedly more electronic in feel and the percussion more standard, and closing track “Good, You Are Distant” continues with this pacing, while taking the melody in a different direction and lessening the EBM feel. It begins with a simple, danceable beat and bass line before giving way to the lightest of Spilles’ vocal performances on the album. The hardcover book edition includes the bonus track “Tree of Life,” a really dark, dark tour de force one expects from a project as experienced and creative has Project Pitchfork. Pounding percussion, hard guitar riffs, evil sounding vocals with some equally villainous harmony, and subtle backing screams really make this song fill up the soundscape. While no track on this album can be considered bad, I wish more of them had the strength this one carries. Following are four remixes and other than the aforementioned “Ascension” remix with vocals from Sue, the only one of major note is the We Are Temporary remix of “Crossfire,” which really changes the entire mood and sound of the song, taking Spilles’ vocals and applying them over an electronica/synthpop track. Akkretion is another quality entry on Project Pitchfork’s curriculum vitae – impeccably produced, the sounds are clean and crisp, the percussion works well with the synths, and Spilles’ gravelly vocals hover over the musical atmospheres pervasively. While technically, there is absolutely nothing to complain about on Akkretion, it is ultimately just another Project Pitchfork album; an enjoyable listen, but with the experience and talent of Spilles, Scheuber, and Jansen, one would expect more creativity than what shows up on this release.